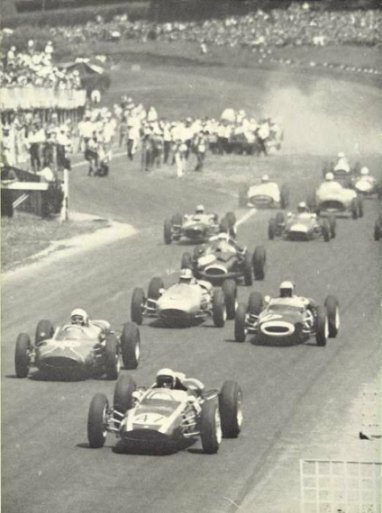 The central issue of the 1963 racing season in New Zealand was whether New Zealand International Grand Prix, on which the rest of New Zealand depended to keep motor racing going on an international scale, would be able to finance and build the new circuit on the Franklin Racing Club's property at Pukekohe, 35 miles south of Auckland. Ardmore, home of the organisation since 1954, had reverted to operational status as an aerodrome during the building of the new airport at Mangere, and was no longer available for motor racing. The hurdle was a formidable one. The new circuit, of 2.21 miles, was estimated to cost �,000, and a complicated lease-hold had to be arranged with the Franklin Racing Club. NZIGP had some �,000 all told which could be put into the venture, no more. But as the biggest promoter in either New Zealand or Australia, with the responsibility of hiring the drivers for the three others here - Levin Motor Racing Club, the Motor Racing Club of Christchurch, and the Southland Car Club - and also for the meetings at Warwick Farm, Sandown Park, Lakeside and Longford, in Australia, it was essential that the New Zealand organisation should find a way to keep going. Differences within the organisation were a further complication, ending with a large-scale reshuffle which left Van Parton, a foundation member, as president, supported by an executive of experienced former drivers and administrators. 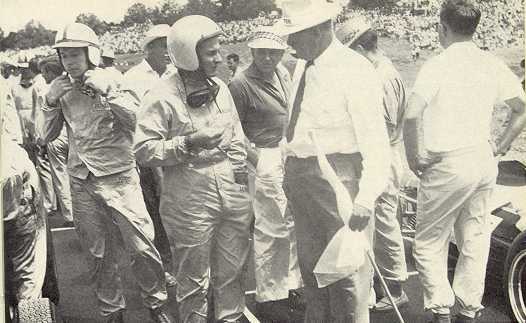 In August of 1962 they set about the apparently hopeless task of raising the money and building the track. Start of race. Surtees (left) getting the jump on McLaren. Well-wishers contributed the best part of �,000 by way of debentures over a 10-year term and also some interest-free loans, money was raised by other means, and a 'fairy godfather' was found in the form of the big contracting firm of W. Stevenson and Sons Ltd. This firm agreed not only to carry out the work, but also to finance the job to the tune of �,000, thus bridging the gap. Eventually the job cost �,000, leaving further problems to be faced in the future. 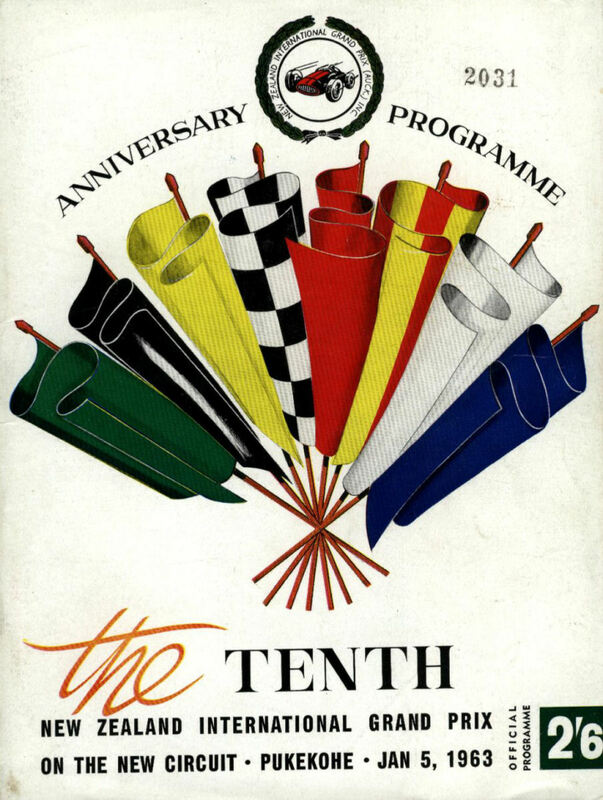 Despite the wettest spring in years and other troubles, the track was started on October 8 - effectively not until the 15th - and virtually completed in eight weeks, although it was not handed over to the organisation until a week before the race. The seemingly impossible had been done. The track was an accomplished fact, with far more permanent facilities than had ever been available at Ardmore, and in the meantime a group of the world's top drivers had shown their faith in the organisation by signing up for a season which would start on a track still non-existent. 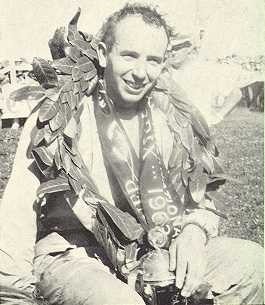 Sweltering in Auckland's sub-tropical heat, 43000 people ringed the new 2.21 mile circuit on 5th January to see the former motor-cycle champion John Surtees win the tenth NZ Grand Prix with consummate ease, after Bruce McLaren had been forced to retire early in the 150 mile classic. 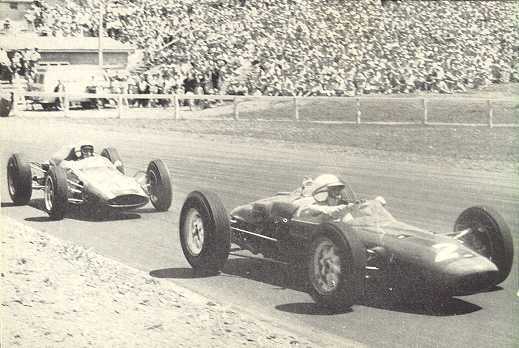 Once again a top field of overseas stars, although not as many as previous years, was contracted for the NZ Grand Prix, with world champion Graham Hill at the top of the list. Hill was entered to drive the controversial Ferguson P99, a revolutionary four-wheel-drive machine powered by the well-proved 2.5-litre Coventry-Climax motor. Challenges were expected to come from Jack Brabham, interestingly the only Australian to put in an appearance, in his 2.7-litre Brabham-Climax, and two 2.7-litre Lola T4's, specially constructed for the Australasian season. Run by the Bowmaker-Yeoman Credit Team under the leadership of Reg Parnell, these cars were driven by John Surtees and the up-and-coming South African Tony Maggs. But the car with best chance of all was Bruce McLaren's light-weight 2.7 Cooper-Climax with which Bruce had won the Australian Grand Prix at Perth the previous November. The car was based on the current FI Cooper T60 frame and was designated a T62. For the past three years the pundits had given Bruce at least a chance of winning his country's major event, but this year there appeared to be more than a probability of his pulling it off. Top locals were Hyslop, out of retirement already, Amon and Shelly, the three who had proved superior in the curtain-raising events earlier in the season. Amon had also entered his older 2.5-litre Cooper but this did not make an appearance. Hyslop entered his Cooper T53 and Chris Amon had Bruce McLaren's 1962 NZGP Cooper T53, while Shelly was driving a very attractive dark blue Lotus 18/21. Bill Thomasen entered his 2-litre Cooper, while the ex-Tony Shelly similar car was driven by the young New Plymouth driver Ian Green, who had previously raced the 1.5-litre 'bob-tailed Cooper-Climax. 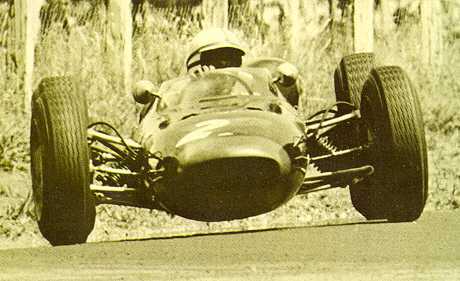 Jim Palmer had his newly imported 1.5-litre Cosworth Lotus 20 while his last year's car, an earlier Lotus 20, was driven by Wellington newcomer Frank Turpie. A similar car to Palmers new one, also recently imported, was to be driven by hillclimb champion Ken Sager. It had a 109E variant motor. Ross Greenville entered his earlier Lotus 18, though he himself was still in England. David Young from Timaru appeared with his dark blue Cooper with the latest Cosworth built motor, and Roly Levis's older model Junior was also now equipped with a 1475cc 109E Ford motor. Other 'converted' Juniors were John Histed's front engined Lola with a 109E engine and Rex Flowers' red Gemini with a 1340cc Cosworth engine. New Zealand champion Pat Hoare had announced his retirement from racing and his glorious Ferrari was up for sale. But as nobody had bought it by the time of the race a first-class car was out of the running. Other big cars amongst the entries were Lionel Bulcraig's red Aston-Martin DBR1-300 recently purchased from Bib Stillwell, Rod Coppins's Tec-Mec, now back as a single seater after an earlier crash, and Bob Smith's now very old Super Squalo Ferrari. Only one sports-car, Cottle's green and grey Mk I Lola was entered and the evergreen Lycoming in Forrest Cardon's hands was the only 'special to make an appearance. Additional entries in the Pukekohe Championship race - an elimination race for the Grand Prix - included Doug Lawrence (Lola sports), Barry Thomas (Barden Junior), Snow Morris (Ford Special) and Jim Boyd in Ivan Cranch's Jaguar-powered 6C Maserati. 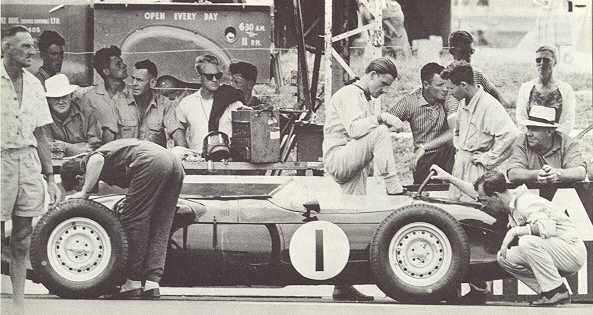 while John Surtees adjusts his helmet. At one stage it looked as though there would be no practice worth mentioning for the Internationals - their air connections from South Africa, where they had all competed in the last Formula I championship race of the year had gone astray. Instead of having two full days free before the race, they were able to have only the Friday, and not even all of that. McLaren, who had had an earlier look at the track, settled down very quickly and recorded fastest lap in 1m 26.8s (91 mph). But this showed conclusively that the track was a good deal tighter than had been anticipated, and that there would be no 100 mph lap in the near future. Surtees was next fastest in 1m 28.2, followed by Brabham 1m 28.3s, Maggs 1m 28.8s and Hill 1m 29.3s. Shelly and Amon tied for fastest lap among the locals at 1m 29.8s, with Hyslop next in 1m 30.7s. Palmer 1m 31.0s and then Thomasen 1m 32.2s. But the surprise proved to be David Young. Driving a Formula Junior Cooper fitted with a 1.5-litre Cosworth Ford engine, he returned 1m 34.2s to show that a good driver with a comparatively low-powered car could make his mark on the twisting Pukekohe circuit. Hill in the pits, pondering the problems with the Ferguson-Climax during practice. Big eve-of-meeting surprise was the switch by young Jim Palmer, whose 21st birthday eve it also was, from his Lotus 1.5, with which he had got down to just under 1m 31s. Offered a drive by Parnell in the spare Cooper 2.7 of the Bowmaker stable, he accepted after an hour's practice in which he had brought the strange car down to 1m 31s. By the time the final practice session ended, fifteen drivers had earned starting positions in the Grand Prix, the slowest being young Dunedin sports car driver Barry Cottle, who managed 1m 40.0s with his 1220 cc Lola-Climax. For the unlucky ones, there was another chance. If they drove in the Pukekohe Championship on race day and broke 1m 40s they would be permitted to start in the main race. Chris Amon led the Pukekohe Championship practically from start to finish in the red and green Cooper, with Hyslop second and Palmer third in the Lotus. Tony Shelly was penalised one minute for jumping the start, which relegated him to fourth position at the finish, ahead of a dueling Bulcraig and Thomasen. David Young was an excellent third before retiring at half-distance. The grid line-up was in a three-two-three formation. Apart from those who had qualified in practice, there were three more who had lapped in less than 1m 40s in the Championship race. These were Ian Green (Cooper), Forrest Cardon (Lycoming) and Ken Sager (Lotus). McLaren leading the rest of the field at the start. Surtees is already ahead and out of picture. But none of the Internationals (except McLaren) was happy. The Ferguson's brakes of Hill were not satisfactory, Surtees had had head gasket trouble and so had Brabham, while Maggs's transmission was not what it should have been. The all-too-short practice and preparation time had prevented the troubles being ironed out. Grid placings were as follows, in order, McLaren on pole, followed by Surtees, Brabham, Maggs, Hill, Amon, Shelly, Hyslop, Palmer, Thomasen, Young, Bulcraig, Histed, Flowers, Cottle, Cardon, Green and Sager. Usually a smart starter, McLaren got too much wheelspin on takeoff and was beaten away from the line by Surtees. Next away were Amon, Brabham, Shelly and Thomasen. Maggs was hampered by his Lola jumping out of gear at the start, his engine revs soared so high that it gave him valve trouble. Meanwhile Hill discovered that the Ferguson lacked first cog. First time round it was Surtees, McLaren, Shelly, Maggs, Hill, Hyslop, Palmer, Thomasen, Young, Cardon, Bulcraig, Green, Histed, Cottle, Flowers - then Brabham, who had lost a lot of time running off at the hairpin and disappearing momentarily down the bank in a cloud of dust. Surtees leading McLaren during the early laps. Lap 2 saw Hill move up to fourth place, even though his clutch failed to engage and he was driving with a crash gearbox, and Brabham to seventh, while Maggs coasted in to retire the Lola with a seized engine. Next to pull in at the pits was Thomasen, making the first of several stops due to overheating. Brabham, after climbing up to fourth, followed him in with the same problem on lap 9; Jack came out again for a few slow laps, but a blown head gasket soon forced him to retire. Meanwhile there had been a change up front. McLaren, after tailing Surtees for eight laps and getting the measure of the Lola, shot past in his Cooper right in front of the stands, to the delight of the crowd. Surtees now hung on grimly to McLaren's tail. Hill lay third, driving in masterly fashion in a car well down on power (not only was the Ferguson's motor smaller, but it was running on avgas while all other internationals were on mixtures). Then came Shelly, Amon and Hyslop, all in a bunch. Already there was a gap back to Palmer, who in turn was well ahead of Cardon, Bulcraig, Green, Histed, Cottle and Flowers. David Young had gone out with ignition trouble; Thomasen was back in the fray, but at the tail of the field. Amon's motor started to miss, and on lap 18 he made a long pit stop for ignition repairs. Another two laps, and Cardon's usually reliable Lycoming went out for keeps with the same trouble. Then McLaren began to show signs of distress, pointing back to a misfiring motor as he went past the pits. Thinking the magneto switch might be faulty, he pulled the wires off it, but this made no difference. By lap 20 his speed on the back straight had dropped from 150 mph to 130, so he called in at the pits, losing his lead to Surtees. Plug connections were checked, and Bruce set out again, now in third place. He managed to re-pass Hill, but the engine still misfired, and on lap 23 he returned to the pits for more attention. A new set of plugs was fitted in 36 seconds flat - but at the same time the mechanics found the real cause of the trouble: a 'cooked magneto. In addition, one of the fuel tanks had cracked and was leaking. Bruce's race was over. Too late, he and his crew realised that it was magneto trouble the car had suffered from in the Australian GP. At the time, they had thought the misfiring was due to something else. On the same lap Surtees, who had been coming up through the field on his first lapping tour, caught Palmer; then, with no McLaren to worry about, he eased back about two seconds a lap. There wasn't much drama left in the race after that. It was just a question of whether the Lola would stay in one piece, and whether Hill could nurse the Ferguson for the whole distance. By lap 32 Surtees was a mile ahead of Hill, with a gap of 13s back to Hyslop and Shelly; all the rest had been lapped, and there had been one more retirement - Ian Green's Cooper. Things livened up a bit when Surtees lapped Shelly on lap 38 and the latter decided to stick with him - which he did, going past to be on the same lap again on the 49th. Surtees sat in behind for 10 laps, then went a lap ahead again. Once more Shelly challenged and passed - but fluctuating oil pressure was unable to stand the strain and a bearing ran on the Lotus, putting it out of the race on lap 62. He was holding 4th place at the time. While this was going on up front, Palmer continued to circulate steadily on his own, a fair way behind Hyslop, who kept just out of Surtees's reach. Bulcraig drove the best race of his career in the Aston-Martin, until its transmission failed on lap 44, when he was lying sixth. Amon then made his final reappearance, after earlier attempts to rejoin the race, and Thomasen woke up to the fact that he could still get in the money if he pushed his car home (after early overheating problems, it had been disabled by gearbox trouble). Histed had battled round on a sick-sounding motor with only one brief pit stop, and Flowers had managed to keep going despite paper in his Gemini's air in-take and a few excursions from the track. This was not spectacular motor racing, for at the end of 75 laps and 165 miles in torrid mid-summer temperatures only five cars were running. Surtees's canny drive brought him home first, but newly crowned champion Hill had the bitter disappointment of walking back to the pits when the gearbox of the Ferguson finally packed up altogether on the very last lap. This left Hastings sheepfarmer Hyslop happily in second place on the same lap, and Jim Palmer in third - the best birthday present he could have wished for. Histed's misfiring Lola stood up to the distance, but Flowers had a long push home, and Thomasen a short one to cross the line. Amon, though his car was now going well, could not better seventh and last placing. It was truly a debacle which the drivers, the organisers and the crowd did not want to see again. Fastest lap: Bruce McLaren 1m 29.5s 88.5 mph on lap 4.